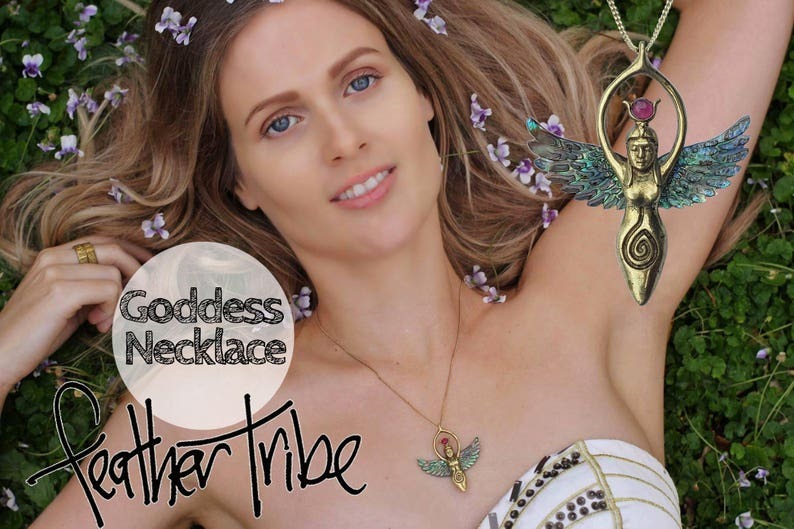 Join the Feather Tribe with this powerful Brass Goddess Necklace with Abalone Wings and Magical Ruby. The Goddess embodies the feminine qualities of the divine and couples that grace with beautiful Abalone Wings and a powerful Ruby. The fiery and captivating Ruby is a stone of nobility, considered the most magnificent of all gems, the queen of stones and the stone of kings. The Brass Goddess Necklace measures 1.88 inches (4.8 cms) long and 1.65 inches (4.2 cms) wide in the wings. The chain is 8.66 inches (22 cms) long. The body of the Goddess Necklace is made from Golden Brass with Abalone Shell Wings and the stone as we mentioned is Ruby. The necklace comes on a gold plated chain.